Monocular laser range finder LRF 400 Sturman is very light, compact, but accurate instrument for observing and measuring distances to objects at a distance up to 400 meters. In addition, this baby still measures the speed of moving objects if they are not moving faster than 300 km/h and are within range (400 m). The working principle is like all modern laser rangefinders: emitter emits laser pulses, the receiver picks up reflected, the microprocessor determines the result of the delay of the received pulses. The procedure works like this: when you press the power button the field of view in the eyepiece appear the indications of the LCD display and sighting mark in the form of a small box, hairline-type optical sight to facilitate aiming, ready indicator and measurement mode indicator. Following a short press activates the measurement and the display appears almost immediately the result of the measurement indicates the quality of measurement. The second button on the housing is used to switch modes, and measurement: short press while the power is on, changes mode between "speed" and "distance", and long-term changes of unit of measure meters to yards and Vice versa or km/h to m/s. Very simple! The display is very clear and at the same time fine lines and inscriptions, they do not interfere with the observations and are not shown when device is off, power, and accordingly, the display turn off automatically if no buttons have been pressed for 20 seconds. The device notifies the owner that it is time to replace the battery if it is "the village" - it comes into view a special indicator. When conducting measurement, the laser indicator is on "lightning". A long press of the power button is continually measuring the change of the result - function "scanning", measurement stops when the button is released. Sturman rangefinder LRF 400 is equipped with eyepiece with the possibility of diopter adjustment. Quality and the possibility of measurement depends on many factors. Just divide them into positive and negative and we note that the maximum results are achieved only if all the positive factors. Positive factors: a Large object; the object surface is smooth and dense surface is a flat surface perpendicular to line of measurement (the laser beam), the surface of the light - ideally white, but not mirrored. The atmosphere is transparent, no precipitation, no clear sun, the beam path has no obstructions. The meter recorded - ideally on a tripod, rangefinder lenses are clean, batteries are fresh. Negative factors: the Small object; the surface is uneven, loose, angle measurement is significantly different from the straight, the surface is dark, it's black. The mirrors are so precisely reflect the beam that it remains focused and does not enter the receiver lens. Fog, dust, rain, snow, bright sun. Rangefinder is shaking in hand, the lens is dirty, the battery is "village". These factors equally affect any laser rangefinders, all manufacturers, so many have developed special modes to circumvent negative factors, but all their influence is unavoidable. 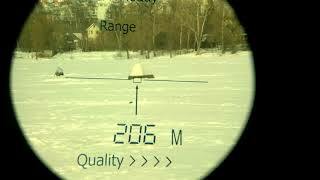 Technical characteristics of rangefinder LRF 400 Sturman. Sturman rangefinder LRF 400 should be stored in the case. The storage room should be dry and well ventilated, the recommended temperature is not below -20C. Do not store the pointer near the heaters, dipped in water, for cleaning specifics. For wiping glass surfaces, use the cloth clean and dry (preferably flannel). To remove any remaining dust and stubborn stains drip on a napkin in 1-2 drops of alcohol or ether. Do not disassemble the rangefinder LRF 400 Sturman! The manufacturer guarantees reliable operation of the appliance within one year from the date of sale, subject to all of the above rules. Демонстрация того, как и что видно в дальномер Sturman LRF 400, как измеряет расстояние до различных объектов. Есть измерение скорости. Съёмка с рук, без штатива, всё как в реальной жизни.